Mark Dyer - Black Tie Real Estate & Investments, Inc.
"NO ONE WORKS HARDER THAN THE OWNER" I moved to this area in 1987 when all that was here was Orange Blossom Gardens, a community of mostly manufactured homes on the east side off 27/441…and nothing else! I have worked in this community and watched this community grow to what we all know and love today. I was married in this area in 1991. My wife and I have raised our 2 boys in this area. Our kids go to school in this area. We are PERSONALLY invested in this area. My PERSONAL experience? I have sold over $250 million or 1,000+ homes in The Villages AND surrounding North Lake, Sumter and Marion counties and have over 40,000 hours of experience doing so. My belief is that if you help people buy what they want and not try to sell them what benefits you more than sooner or later those happy people would refer happy friends and family. That simple formula has worked. I have consistently been in the top, most well respected group of real estate professionals for the last decade in this community! I’ve watched some incredible changes in The Villages since 1987 and unfortunately I’ve seen some changes that were not so good. I came to the conclusion that there is a better way to really care and represent people as they buy and sell homes. 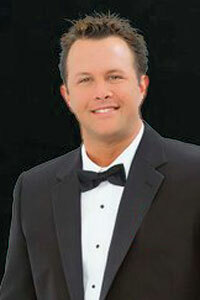 I’ve now named it the “Black Tie PERSONAL Service.” I chose the black tie logo to signify excellence. I chose the two different sets of letters (fonts) in the logo for very specific reasons. The top font “Black Tie” was set in a “fun” font style. The bold “REAL ESTATE & INVESTMENTS” font was chosen AND placed for a PERSONAL reason; these letters signify excellence and by placing them under the “fun font” I wanted people to visually see that underneath all the fun is a professional, solid structural foundation of expertise, professionalism and excellence! If I put that kind of effort into something as simple as our logo how much more effort and focus will our team put into helping you make this extremely important PERSONAL decision? IT’S ALL ABOUT A PERSONAL RELATIONSHIP WHEN THE DECISION AND INVESTMENT IS THIS PERSONALLY IMPORTANT TO YOU!YOU NEED SOMEONE ON YOUR SIDE!